This is an often needed utility module. The mixer comes in handy for mixing CV sources and audio sources as well. This version is DC coupled, so you can use it for AC and DC mixing. There is an inverted output added. 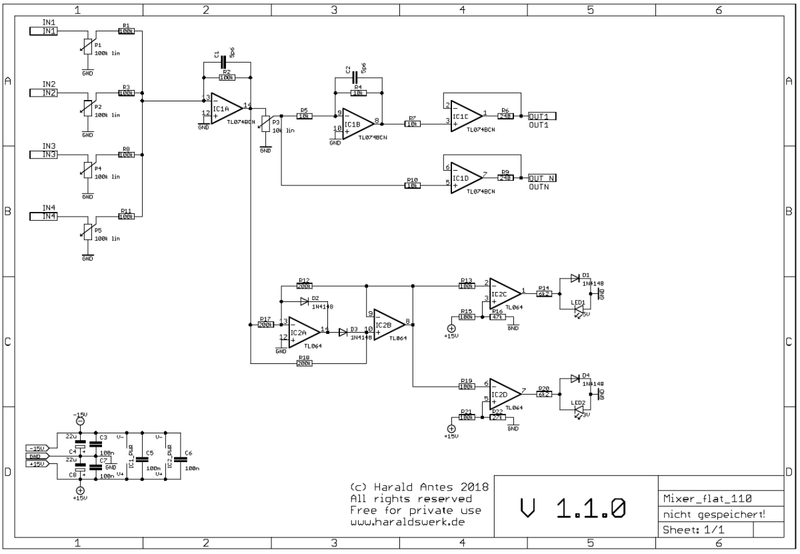 You can reverse the DC-CV mix with it or experiment with feedback loops in the audio domain. The added volume indicator us useful for finding the appropriate signal level. The volume indicator is optional. You can leave it out with no problems for the other functions. Most noticeable change is moving to a "flat" design. The depth of the module is significantly reduced and most important no more potentiometer wiring is needed! Straight forward design. The mixer is completely DC coupled. So you can use it for CV mixing as well as audio mixing. IC1A sums the four inputs. P5 is used to adjust the overall signal level. The level indicator is build around IC2. A precision full wave rectifier followed by two comparators to indicate the high an low level.